"Among both the jihadists and the equality warriors we find a misguided, irrational need to tailor our nature to preconceived modern notions of human existence and interaction rather than acknowledging the intrinsic characteristics and needs of humanity as a whole, timeless qualities not constricted by particular circumstances and lifestyles"
If there is one common theme to be found among the great minds of the East from the 19th and 20th centuries – men such as Fyodor Dostoevsky, Nikolay Danilevsky, Konstantin Leontiev, Konstantin Pobedonostsev, Ivan Ilyin, or Aleksandr Solzhenitsyn, as well as like-minded contemporary greats from the West like Edmund Burke, Joseph De Maistre, Juan Donoso Cortes, Oswald Spengler and Julius Evola – it is the quest to salvage essential meaning and purpose for man’s existence. In critically investigating matters associated with the great social and political upheavals in the post Enlightenment/Early Modern era, these thinkers placed themselves by definition at odds with most of the prevailing social trends of their time. So far ahead were they in both depth and rigor of analysis, we rightly regard them even today as contemporaries, as visionaries with powerful imagination and proven ability to peer into the future. It is therefore natural for the believer in an eternal Tradition, despite all particular modes and circumstances of life which may surround him at any one period of known time, to hold steadfast to the enduring wisdom and guidance these men of depth can provide. Let us place this assertion into perspective: Exactly one hundred years ago, what was essentially pivot of power of all known human civilization – a Europe of empires and colonies – erupted, contrary to all expectations of ordinary people throughout the Continent at the time, into fratricidal war of titanic scale. The diligent historian evidently knew more than the everyday citizen, though even he could not pinpoint exactly what triggered a chain reaction to change the entire course of known history. In any case, this disaster was wholly contradictory to the very fiber of imperial order so entrenched right up to the eve of the conflict, with practically every known European monarchy at the time in actual familial relations with one another via individual members of their respective households. Three of the greatest known monarchs of the time – Nicholas II of Russia, Wilhelm II of Germany and George V of Great Britain – were all cousins. For this reason alone, Europe, cherished and esteemed the world over, should have endured much longer than it actually did. Instead, it suffered total collapse in four years of total war. 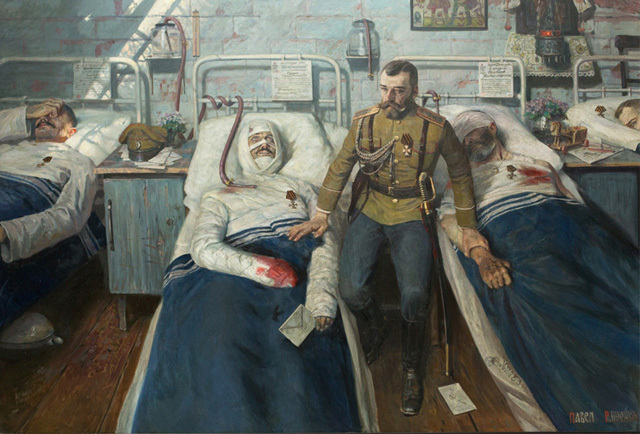 Nicholas II attends to his men in a field hospital. Painting by Pavel Ryzhenko. Man cannot place a padlock on his destiny, however strong the iron he would weld to that purpose. And we must not take for granted what defies all common expectations, whatever the most widely held perception of reality might be in our age. This notion is shared among all who have their origins in what we once knew as Christian Europe. Paradoxically, all the carnage and turmoil of the Great War, acknowledged as a failure in itself, did not halt the advance of modern technology in fundamentally reshaping human society. Rather, the war propelled us into an altogether different existence, a state that has endured up to the present moment. Imagine, for example, that the Great War was by some freak occurrence halted as quickly and arbitrarily as it had begun, and that the old world would have continued to exist and to move at a steady, customary pace. Computers might not exist as we know them, car motors would be rare and unpopular, and railways would be highly developed and well-maintained. The utterly destructive and traumatic phenomenon of war can produce changes of extraordinary magnitude; the feverish race to obtain ever more effective weapons of killing and subduing the enemy can also in turn permanently transform the entire civilian landscape through technological development. Here we must examine the factor of permanence – mysteriously it coincides with the opposing eventuality of uprooted expectations mentioned earlier. Tectonic change occurs quite suddenly, yet as soon it has taken shape a new “permanence” ensues, one differing wholesale from circumstances prior to the moment of transition. Going back is impossible, whatever lingering impulses or affinities remain in our present. Perhaps this is the main objective of the adherent of Tradition, to explain with both clarity and depth what is always essential in man and for man, to withstand and even command change, expected or otherwise. One cannot fail but to notice a manifest desire for change in a postmodern world seemingly starved of ideas and ruptured in values, yet in that very situation we also contend with a myriad of conflicting desires regarding its nature and character. Some of those desires have already begun to yield results, even before a wholesale transformation has yet to capture the popular consciousness. Just one visible case is the convergence of Muslim fundamentalist fighters from multiple countries onto Syria and Iraq. Each of these jihadists answered the same call, with the aid of power brokers in Washington, Europe, and the Gulf states, to wage holy war and shape the future of the world according to their principles. The results so far, needless to say, are an utter atrocity, a complete failure for one segment of humanity realize a just and peaceful society. Perhaps the biggest mistake of the mujahedin, apart from their woefully blind ignorance, is their utmost determination to return all life to the past – and not just any past, but one ruled by a particular tribe of people, along with the dominance of their language, customs and way of being, everything, to the last letter, if possible. And even if they were to manage to achieve every single one of their objectives, it is still not at all guaranteed that such a triumph would bring them contentment. Reversion to the life of another epoch is a fruitless endeavor, as it negates the value of all things intrinsically beneficial to man which have been achieved or invented in the years and centuries following the idealized era, not to mention the inability to hide the evidently unideal tendencies of that given time. With a parallel nihilistic end, the Western liberal assault on the human essence through the propagation of homosexuality and the ultimate dissolution of gender, has evolved successively through a century’s worth of social engineering, particularly with regard to the forcible erosion of the family as society’s core unit for survival. Among both the jihadists and the equality warriors we find a misguided, irrational need to tailor our nature to preconceived modern notions of human existence and interaction rather than acknowledging the intrinsic characteristics and needs of humanity as a whole, timeless qualities not constricted by particular circumstances and lifestyles. Whatever its pretenses, modernity cannot herald the complete erasure of the past ad nihilo, but neither can it ever lead us back to a past already lived. Tradition even in its socio-political aspect seeks to recapture the essence of man, fulfilling his transcendent purpose while providing assurance for homeland, family and identity. 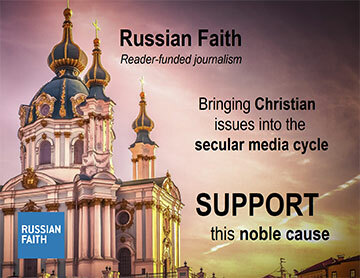 In its growing resistance to Western aggression, Russia more and more becomes the focal point of Traditional revival, seeking to restore the best elements of a monumental legacy. This is, of course, in Russia’s interest, but it would also benefit an altogether new generation of mankind – all in conjunction with preserving what is good from the present era, East and West, as a matter of historical continuity. The old pagan Rome crumbled but eventually found new life in Constantinople, the New Christian Rome. And so today the geographical pivot of human civilization is shifting decisively from the decaying Euro-Atlantic to a new and budding Eurasia, to the East once again. Revival through Tradition directs the way forward; Tradition is our future.